A very simple and yet easy to prepare recipe with a unique taste. My family likes this dish very much. You can serve these chops as a starter or it can also work as a side dish. Wash and dry the mutton chops. Add the chops in a pressure cooker along with 3 cups of water, ginger, garlic, salt and red chili. Pressure cook for 12 min until the chops are tender. In a large bowl add vinegar, hot sauce, honey, corn flour, flour, 1 teaspoon salt, black pepper, crushed chill, egg and white pepper. Mix well to make a uniform paste. Add the mutton chops and toss to coat. Marinate for 2 hours. in a large deep frying pan heat 2 cups of oil. Roll the chops in bread crumbs and fry the chops in batches until turn golden brown. Take out on paper towel so that the excess oil is absorbed by the towel. 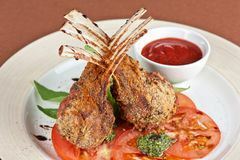 Transfer the chops to serving dish, garnish with sliced tomatoes, lemon and serve with sauce.